This entry was posted on December 20, 2017 by Jessica Anderson. Our 2017 Product of the Year, the Hole in One Golf Plaque! For the 2017 Product of the Year, our staff chose a golf award, the Hole-In-One Golf Plaque! This extremely popular golf award has sold over 75 times so far this year! Wow, who knew so many lucky folks made holes in one on the golf course! This golf plaque features a #1 figure that can hold the lucky golf ball that made the once-in-a-lifetime shot. To the right is customized etching with the golfer's name, golf course name, hole name, yardage, golf club used, and date. 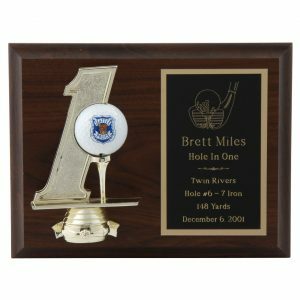 At an affordable price of $38.00 each, this golf plaque makes a great gift to acknowledge a special moment in time! Country clubs can give it to members, golfing buddies can commemorate the epic shot! Thank you to our supplier Plastic Dress Up (PDU) for creating the components for this awesome award. Also, a shout out to Paul, our rotary engraver, for the beautiful etching on each and every one of these special golf plaques. A great product choice for 2017, check it out here! Cheers!